If you are following me on social media platforms, you must be well aware of my love for Twitter. Facebook and Instagram appeal to me, but nowhere close to my attraction towards Twitter. My Twitter journey started almost 7 years ago and ever since I have been trying, testing and using various tools and softwares that help me tweet more effectively. By effective usage, I imply, scheduling tweets while also gauging their impact and reach (the analytics) among other things. 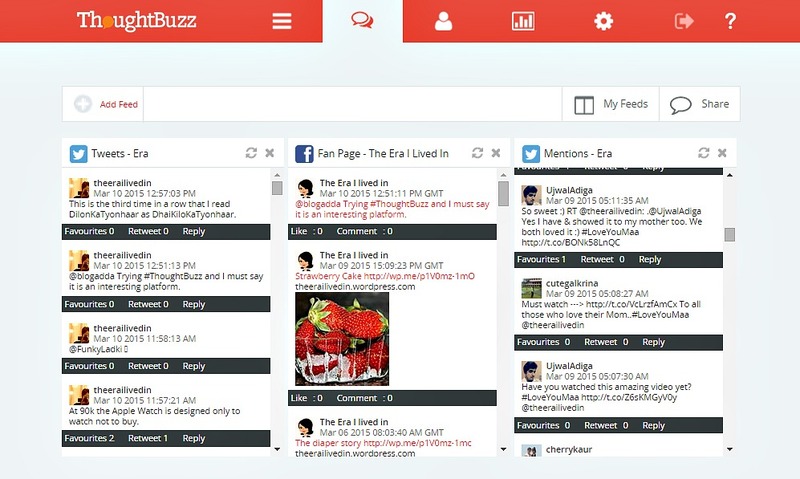 Recently, Blogadda introduced me to an interactive social media management tool, Thoughtbuzz . Though I am not a geek and nowhere close to a pro in understanding social media or brand promotion strategies, but being a prolific user of social networking sites, such products never fail to attract my attention. I am checking out Thoughtbuzz as a part of an activity at BlogAdda. ThoughtBuzz is a Singapore based creative digital agency, established in 2008. ThoughtBuzz has a network of offices in India, Manila, Jakarta and Kuala Lumpur, providing leading technology and methodology for businesses worldwide. They serve clients ranging from small enterprises to government bodies, from risk management to marketing management. Thoughtbuzz has worked with some of the big names in the industry such as Toyota, P&G and Myntra to name a few. In today’s era social marketing holds immense importance. From PM Modi’s tweets during election period to brands working at strategies to trend on Twitter and Facebook, all involve social media strategies and use of analytical tools to gauge their impact. Instagram isn’t too far behind in helping brands for promotional purposes. At such times, Thoughtbuzz comes across as a very handy tool. Overview: The very first thing I noticed while browsing Thoughtbuzz was its ability to collect data from multiple platforms using a single dashboard. While signing up, we come across this page. 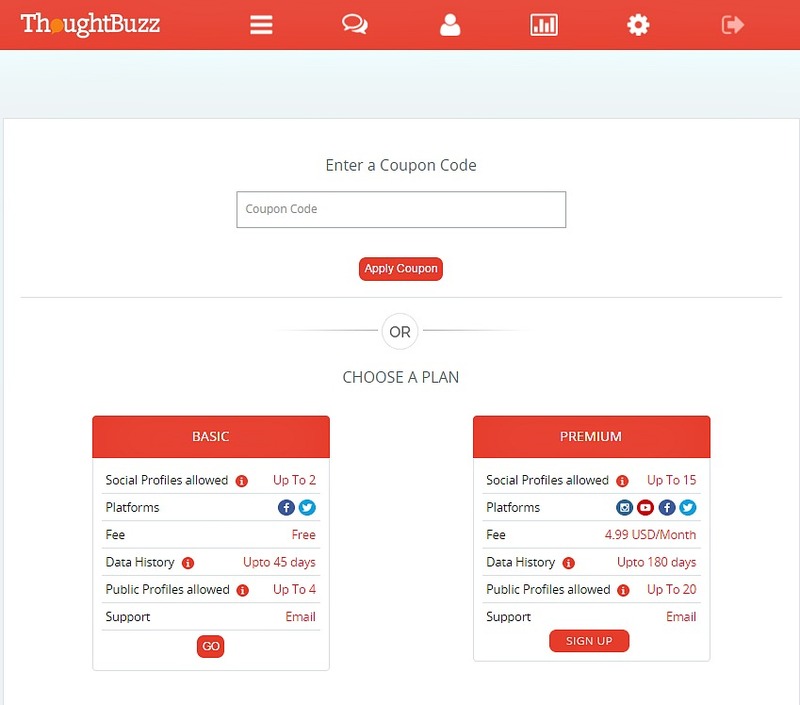 Besides, showcasing the ‘basic’ and ‘premium’ plans, you can see that Thoughtbuzz (premium) allows collating data from 4 major platforms. That is indeed handy and something I haven’t come across on any tools I have used before. As I was still exploring Thoughtbuzz, I signed up for the basic version in quick, easy steps. This provided me the freedom to work on my social media profiles. I am a novice with Instagram and don’t use YouTube as a channel to broadcast, so the basic plan actually worked perfectly for me. 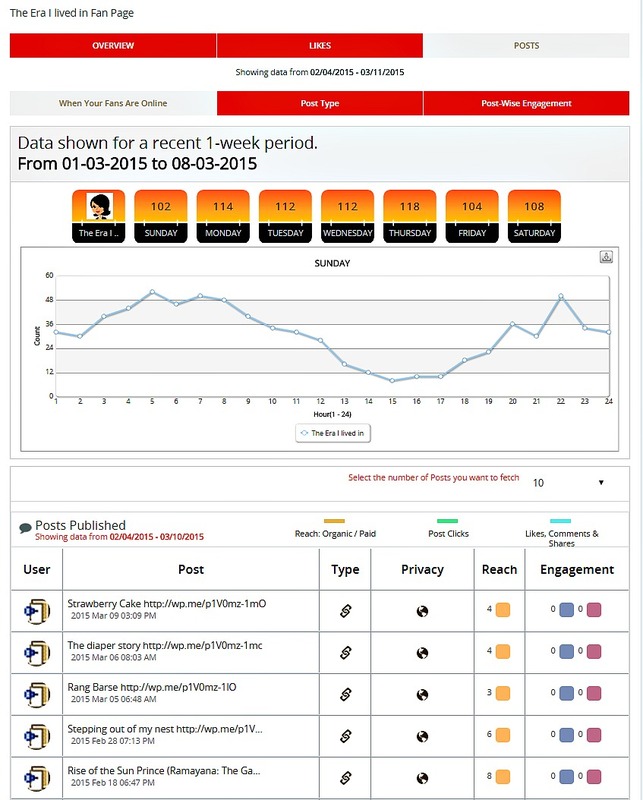 Sharing: Thoughtbuzz has an easy to use, user-friendly, self-explanatory interface. As you browse, you come across sections where you can check for trends across various platforms, view notifications, know your top fans and share updates too. All from the same platform. Access all your feeds on one page. The best feature is, it allows scheduling tweets and Facebook updates all from the same page. Though scheduling features exist on many platforms but the ability to schedule for Facebook as well as Twitter from one tool comes handy for people like me who post multiple updates all day. Easy Scheduling of tweets and updates. Identify: Thoughtbuzz gives this wonderful opportunity to import contacts from any of our social profiles to help analyse and identify influencers. To brands, it could translate to finding the people who are helping in brand endorsements via ‘likes’ ‘mentions’ and ‘re-tweets’. Identifying influencers can go a long way in strengthening brand image. Having walked in those shoes a few times, I could well appreciate the importance of this feature. Import of contacts to help recognize the influencers. In my case, I could browse across all contacts to recognize top community members on the small social media community I have built for myself across Twitter and Facebook. The best bit is Thoughtbuzz doesn’t import all contacts but the ones who have been interacting or bringing about a noteworthy influence, helping cut down on the time spent in browsing for results that matter. Analysis: This is the most powerful section of Thoughtbuzz because it provides detailed insight about all aspects of social marketing and crunching numbers for easy comparison of data. From fetching the most retweeted tweets and their retweet counts to graphical representation of likes, shares, follower counts, top user locations and more all can be accessed easily and understood easily by a layperson like yours truly. Facebook Fan Page stats to give me a clear picture of reader engagement. There’s more to the goodness of Thoughtbuzz. It is fully mobile optimized, enabling you to keep track of important updates and activity on your social accounts. All graphs, charts that you see on the web are available on mobile and tablet screens as well. That keeps you updated on the go. Customer Care: I had a couple of queries about Thoughtbuzz, to seek answers I shot an email to the customer care service and received a satisfactory reply in under four hours. This is a huge plus, given the fact that the need to contact the team can arise anytime. As part of my communication with the team at Thoughtbuzz I have been informed, that their team is in the process of rolling out a native mobile app, soon. I am sure it will significantly add to the freedom of accessing it quickly on the go. Pricing: The current pricing of the premium version is $4.99 per month. Room for improvement: One of the principle issues I faced with Thoughtbuzz was the delay in loading the data and the slow speed of processing the same. I have a fast speed Internet connection, so slow speed cause of that is totally ruled out. The slow speed has been quite distracting and I am sure it is one issue that needs to be worked upon. The second, minor issue is the absence of a login tab at the homepage. Every time I visit Thoughtbuzz I have to click on ‘Create a free account now’ option to be directed to a ‘Sign In’ option. These extra steps can be easily avoided to enhance the experience for its users. Verdict: I found Thoughtbuzz impressive with a clean, user-friendly and self-explanatory interface. It has been designed to be accessed easily by the professionals and the novice analysts (like yours truly) with same ease. The convenience of monitoring performance while updating and scheduling updates on various platforms is surely a futuristic approach by Thoughtbuzz. I’d highly recommend Thoughtbuzz to everyone who’d like to analyse his performance on social networking sites. Begin with the basic plan and maybe upgrade it to premium with time and as per need.